Stonehead was a big part of the Rock Lords theme. 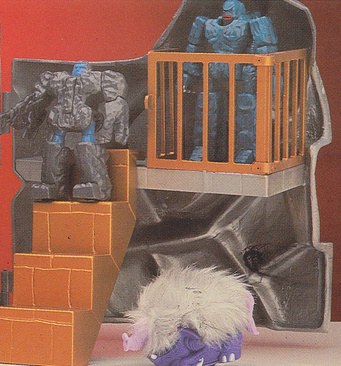 This fortress featured heavily in the movie, packaging artwork and minicomic that came with the toys. It never received any sort of toy however. In the eighties, it seemed that every toyline got a big playset, and at the design stage, Rock Lords was no exception. 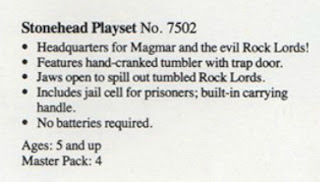 It seems that the heavy focus on Stonehead was indeed meant to increase interest in the Stonehead playset; only it was never released. The most famous prototype appears in the 1986 Tonka catalogue. Rather than be a fortress as in the cartoon, this was a large stone head with a handle on the side and a moving mouth. 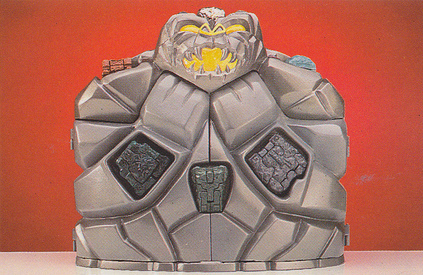 Whilst not really matching the other depictions of Stonehead, the design is still very striking and given the alternative colour schemes on the other Rock Lords in the shot, it was probably not the final colours. There is space around the steps on the side for Rock Lords to stand, and a little stickered control panel, though this is as far as it goes for being able to place figures. The entirety of the head seems to be based around the 'tumbler' mechanism. This was not a hand crank that posted bad internet memes (edgy joke) but instead... well, it's not actually clear what it did. Tonka were obviously determined that something somewhere would tumble. 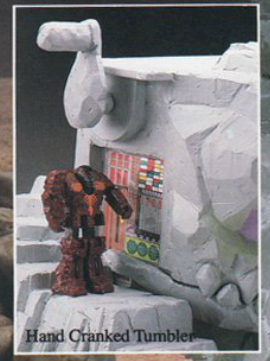 The movie featured a 'tumbler' inside Stonehead that Magmar would put his victims into, though it doesn't seem that this playset would have ground up kids toys into dust. 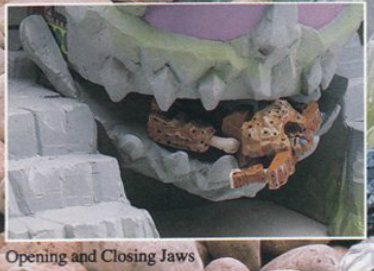 Whilst the opening and closing mouth could have been just there to grab toys, it's more likely that Stonehead would have featured a mechanism for placing toys in rock mode in the top and then by cranking the handle, 'tumble' them out of the mouth. There doesn't seem to be a lot of clearance for the mouth to do this, and given the varying shapes and sizes of Rock Lords, it's unlikely any would have tumbled far. This may be one of the reasons this set was cancelled. The description for the set gives more features which can't be seen on any existing photograph. It clarifies that the tumbler mechanism involved a trap door (did the handle just open a trap door and the mouth have to be opened manually?) and it also had a jail cell and carrying handle. There's no handle on the prototype and no jail cell, unless it was hidden around the other side. Could the model have been a very early prototype, or was more in development? It's certainly odd that a villain base was being made where usually it is the good guy base that is first to shelves. Even more interesting is that there was a second prototype (thanks to a kind reader for alerting me to this!). 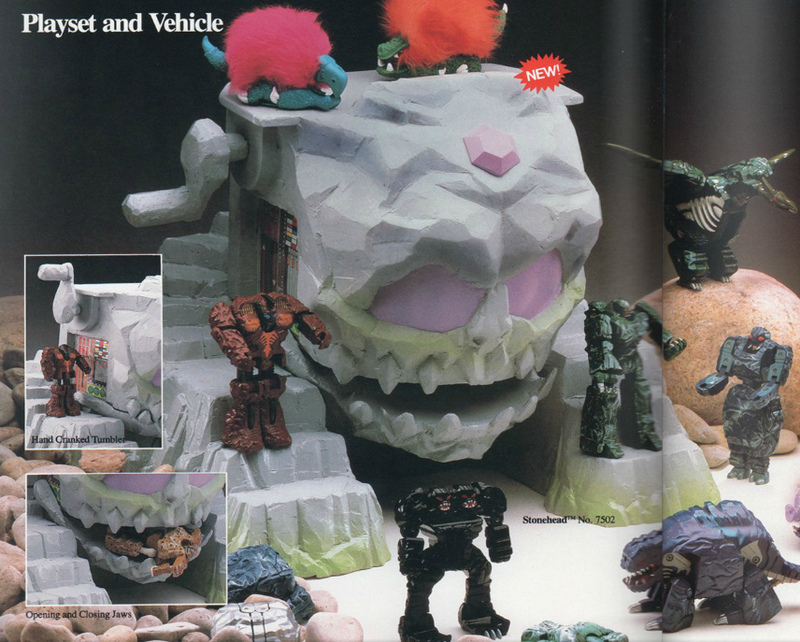 It appeared in a 1987 Bandai catalogue. It is a much simpler design than the Tonka one, but no less effective, and features many of the gimmicks the Tonka one claimed to but did not evidence in the image. Were these two different sets, or was the first a very rough prototype of the second? 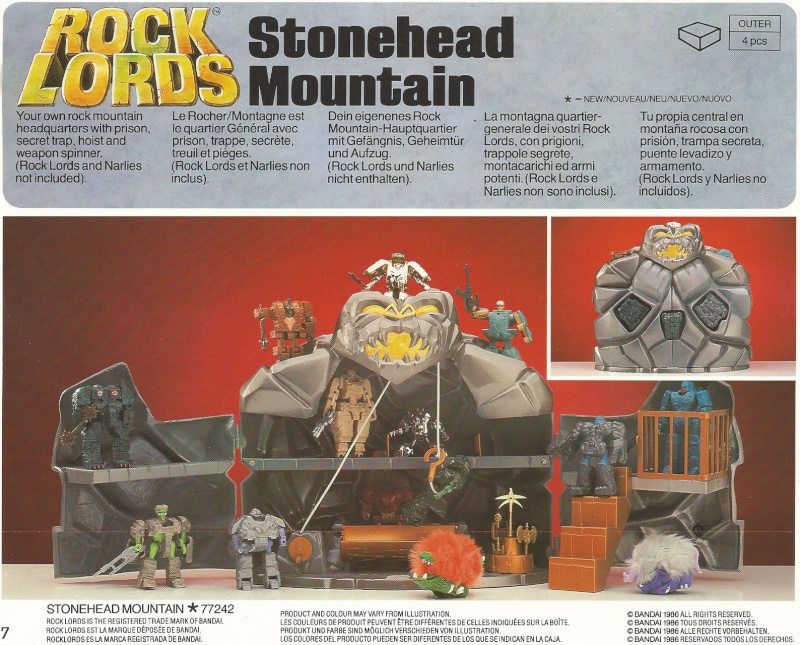 This version of Stonehead is a much more traditional playset in the style of Castle Grayskull from He-Man. It has a carry-case like design (I would not be surprised to see a handle behind the head) which unfolds into an interior with several platforms. This is something you could easily imagine being on a shop shelf and having a reason to buy it (unlike the strange tumbling head of the first prototype). The description states that it has a 'secret trap' but this is so secret that I can't see it, so I would probably fall victim to the perils of Stonehead! One of the coolest things about this set is that when closed up, there are spaces to fit individual Rock Lords in rock mode! There are specially cut shapes in the front for Tombstone, Sticks'N'Stones and Granite, and what look like more generic slots in the shoulders and top of the head. It's really imaginative, but I wonder how well they would have stayed in the slots, and of course the issue that the front ones were specific to particular toys. Inside we can see some of the gimmicks. There's a 'weapon spinner' which is weapon storage that also apes the device for capturing weapons in the movie. There's a hoist to winch your Rock Lords (somehow) up, and a trough that looks to be a much more low-tech tumbler! As I said earlier, the designers were determined that someone was going to get tumbled somehow! There's also a prison which seems easily escapable but adds a bit of play value! Why did this set never come out? It's much simpler (and presumably cheaper) than the orginal design, with a lot of play value, and exactly the sort of thing other lines were putting out at the time. 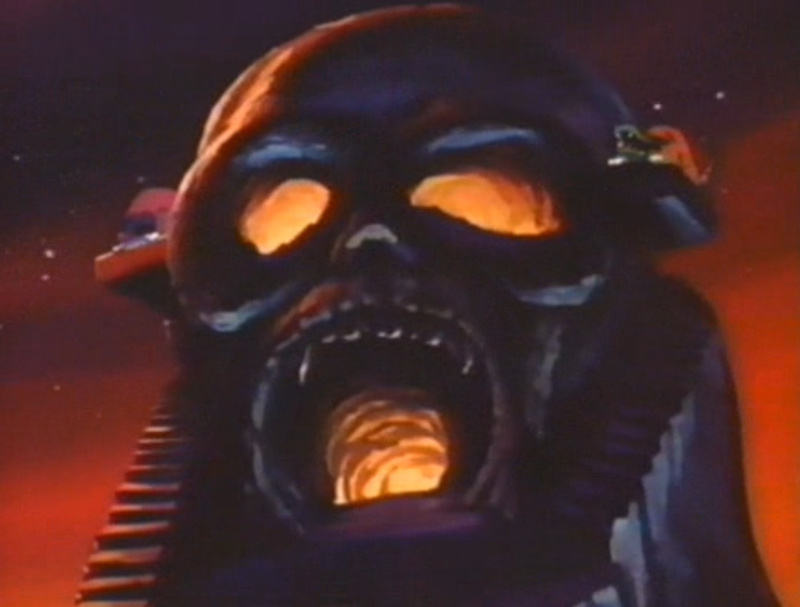 By 1987 the Rock Lords flame was waning. Perhaps this was just developed too late.